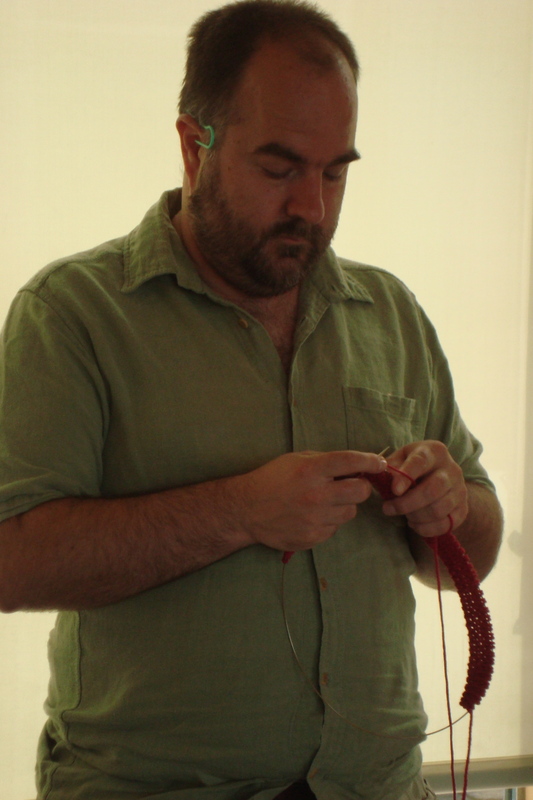 I’m working on a knitting project. I started it for the Ravelympics and cast on during the opening ceremonies of the Vancouver 2010 Olympic Games. 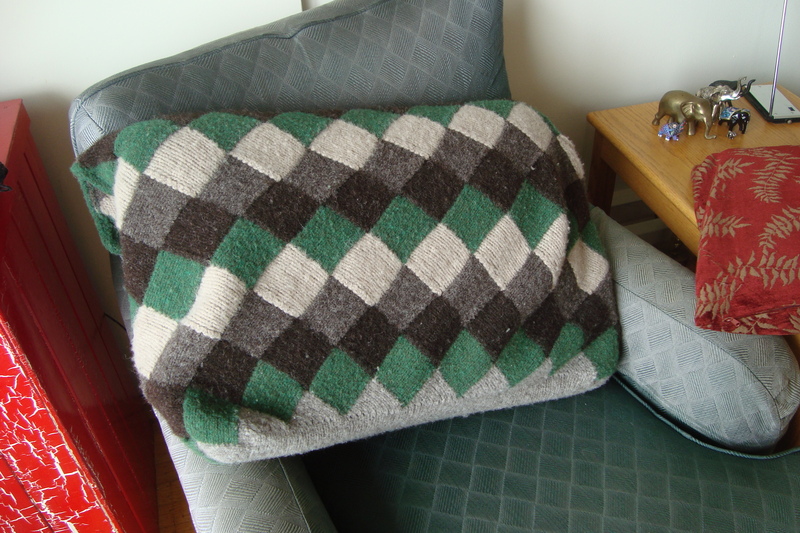 My goal – to write a pattern that I would submit to Knitty once it was written and I had knit the sample. 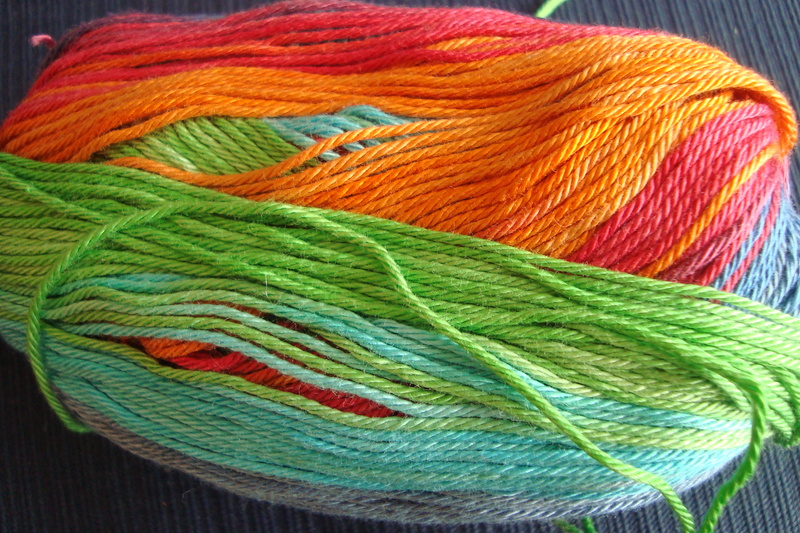 The idea is good, the yarn I’ve chosen I really like – I get gauge! So why have I sat on occasion paralyzed by it? And not only by the problem at hand – I’ve suffered this trauma for years. 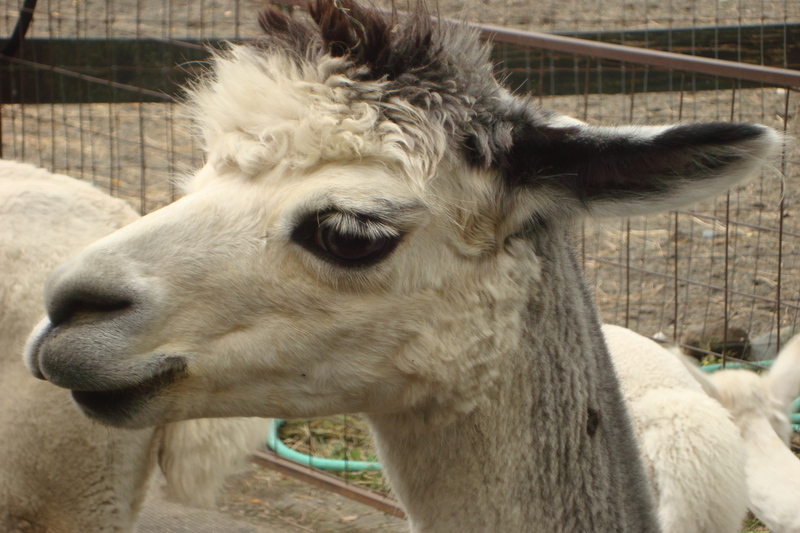 When faced with a problem I will do anything other than solve it – hmmm, those chips look tasty; oh, do we have ice cream? What? We don’t have ice cream? I’ll go get some! I’ve even been intending to blog about it right here. For two weeks now. The words run through my head. The thoughts crowd around, all of them brilliant, witty, perfect bon mots which, if I wrote them down would have people spreading the news of my brilliant thoughts all over the internet – Facebook, Twitter, Gmail and social networking sites I’ve never even heard of. But no. Instead I sit, squashed under the weight of the responsibility I’ve given myself. Like it’s a big thing. The next big thing. And the ideas drift off, lost in the mists of my mind. So today, I am writing this. I need to kill the inertia. And by putting fingers to keyboard, I’m at least doing something – attempting to understand this crushing inertia that sits on me. A fear of failure? rejection? work? success? If I don’t finish this project then I won’t be rejected by Knitty. If I don’t finish this project then it will be there for me later. If I don’t finish this project I can put it away in the closet with a few other UFOs I’ve stashed away guiltily. If I don’t finish this project I’ll have more time for reading, searching the internet, doing the laundry, washing the dishes, drinking a glass of wine. 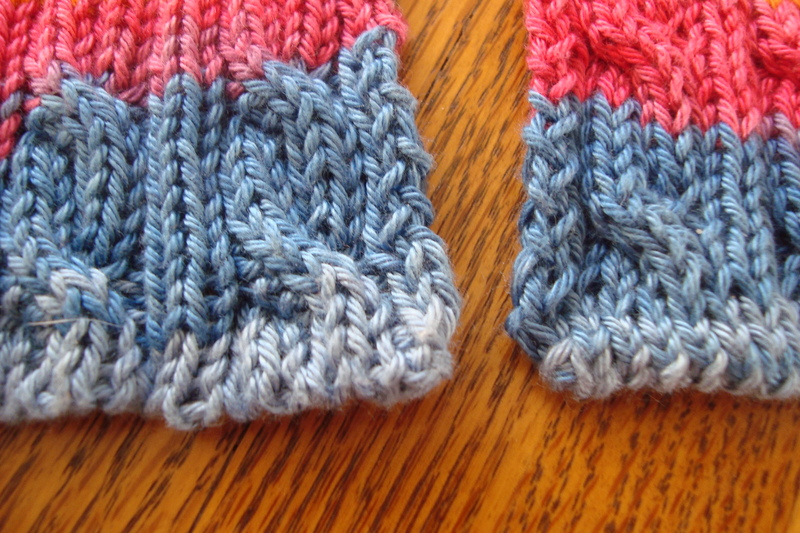 Not only did I finish the second sleeve, but I also did lots of editing of the pattern today. The horizon looks brighter. Now – blocking and joining and all that fun. Tomorrow’s tasks already mounting up. I’ll have to go to bed and sleep on it. 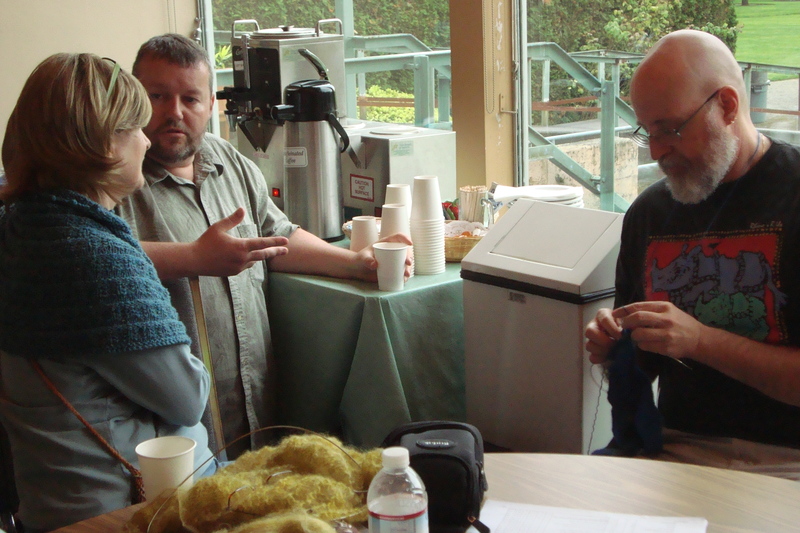 The Men’s Fall Knitting Retreat 2009 was one of the highlights of my year. 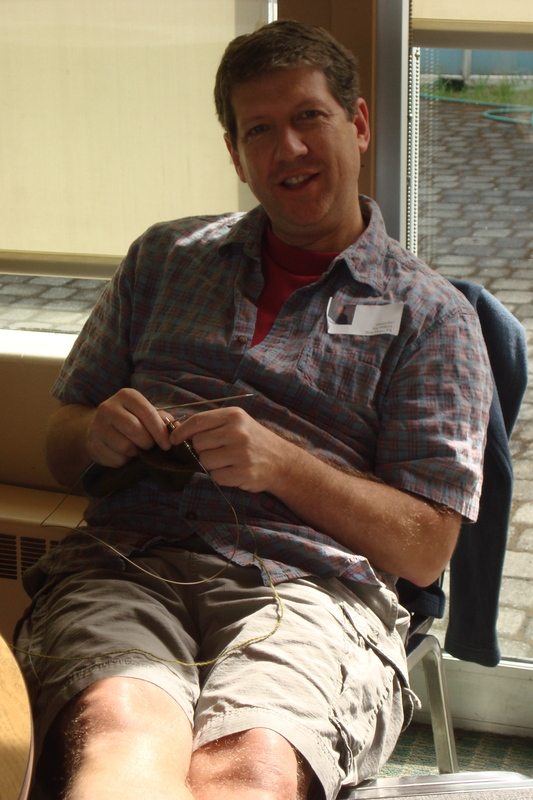 Yes, Socksummit 2009 was wonderful but even more so was the oppotunity to meet and knit with 28 other men who all knit great stuff and share their pleasure and knowledge with all of us. A great experience for me and one I want to repeat year after year now – as a matter of fact once a month would be nice too. 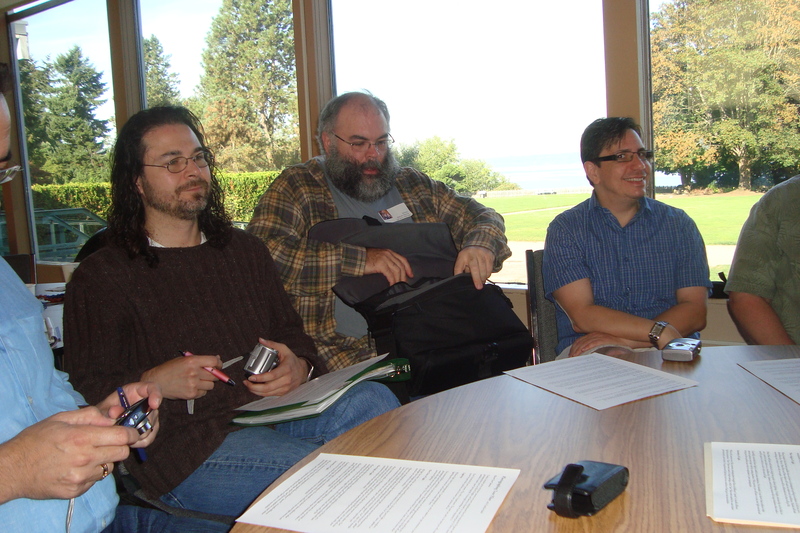 The Dumas Bay Center was a great location – we had a wonderful meeting room, with windows overlooking a beautiful green lawn and the deep blue of Puget Sound. The food was excellent – Chef Rob took care of us a little too well perhaps – all those desserts I enjoyed. The wine was generously shared and poured. My bed was comfortable and I had a great view of the Sound from it too. And the grab-bag of wonderful things provided by yarn stores and people was an unexpected and very happy surprise. 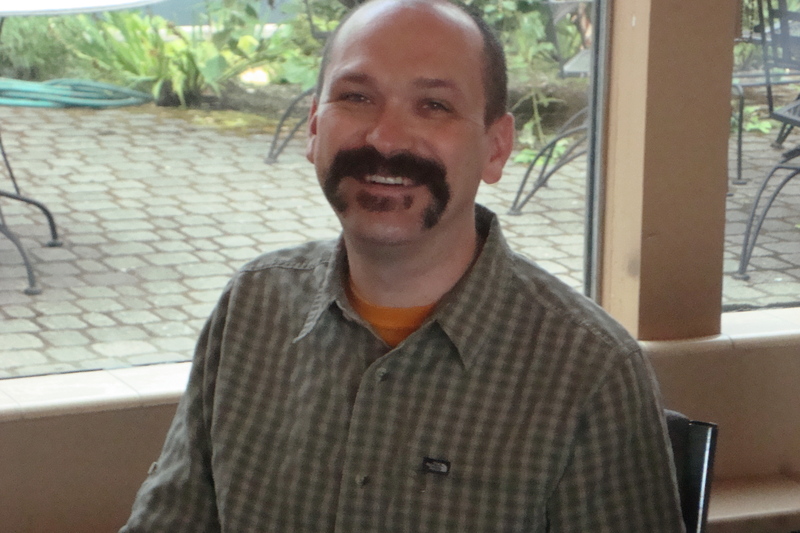 WonderMike was such a good host – he led all the group events and kept us on our toes and on schedule. 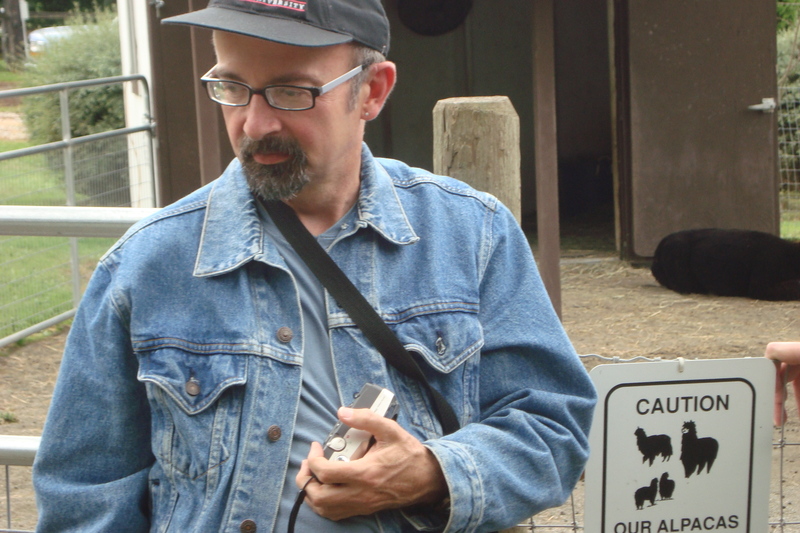 Franklin was there – one of my favourite bloggers and a great person to know. He led the photography workshop and I have been using the ideas he shared with us ever since as well as telling others about it. Not all the photos you will see here were taken post class so don’t expect perfection yet. Franklin has a big lens. We toured too. 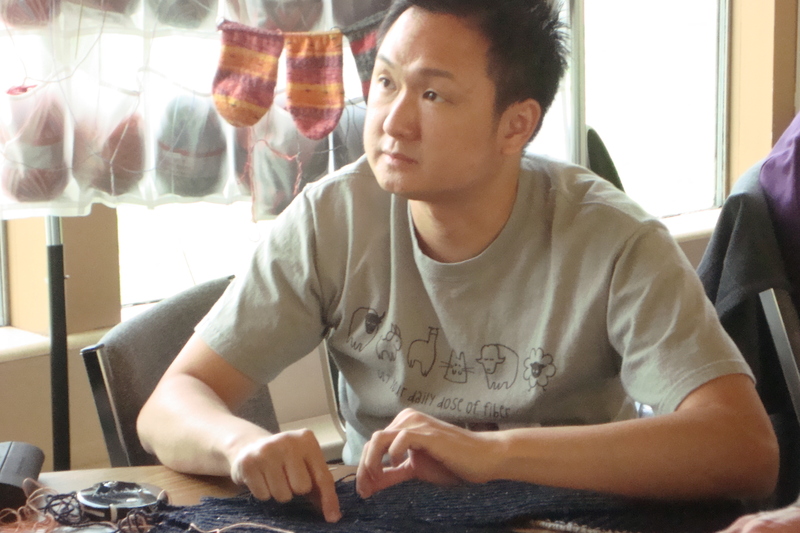 Here is Skacel Yarns for whom co-host Brian works and designs great patterns. He showed us his Knit Boxers and I had to have the pattern – haven’t bought the yarn yet but I know they are going to be fun to wear around the house. I looked for the pattern on the website but didn’t see it there. 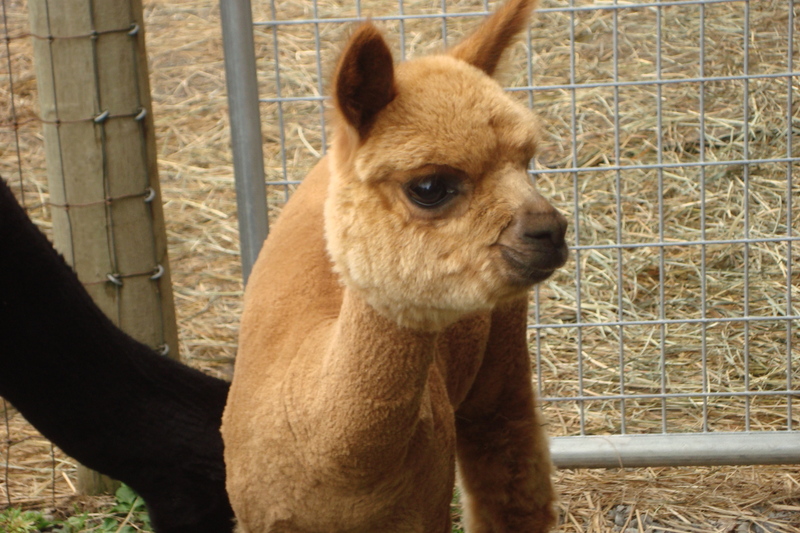 You’ll have to wait until I’ve knit it. Look at us in the reflection - all ready to explore. Franklin Habit on the left, then Brian and his colleagues from Skacel. We got a tour of Skacel’s operations. 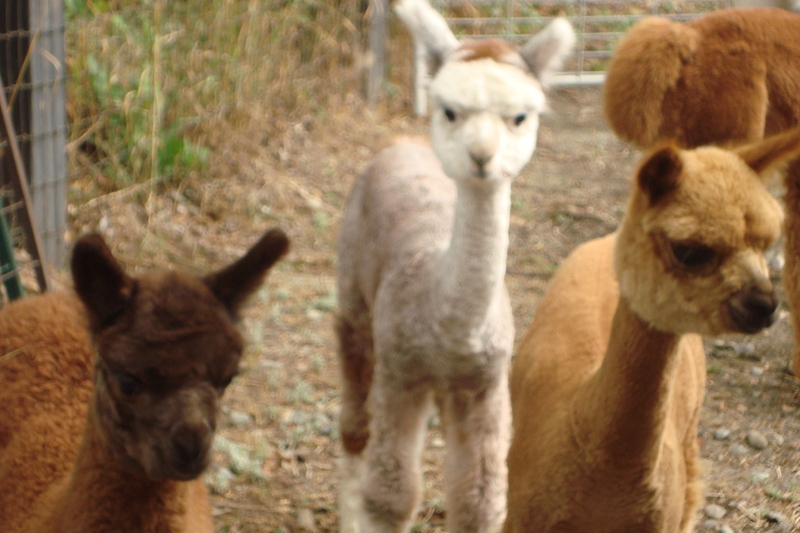 They are wholesale, but the opportunity to be surrounded by so much yarn was not to be missed. 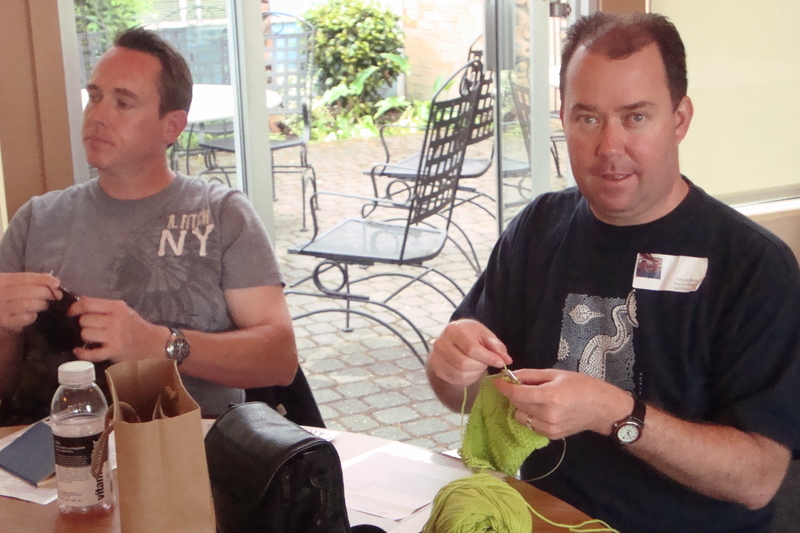 And yes we were able to buy yarn through one of their customers, Morgan, who was also at the retreat with us. 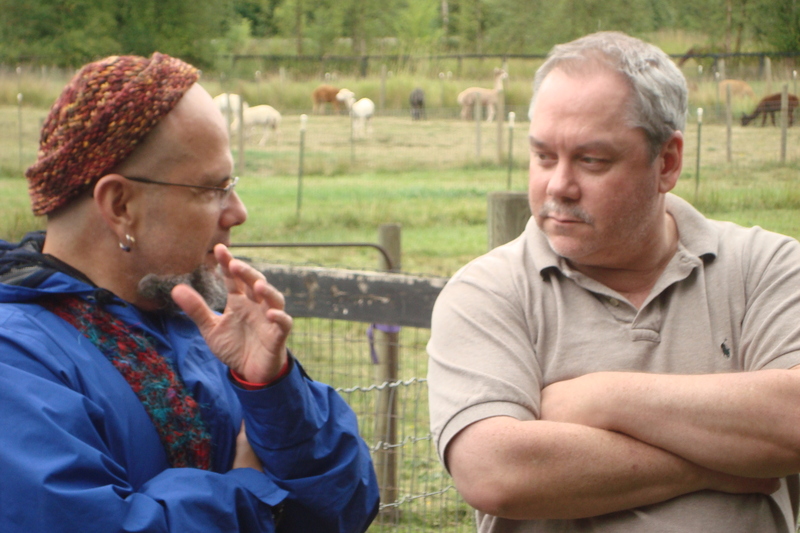 Here are some of the others who shared the retreat experience with me. I didn’t get everyone, but you will get a flavour of the group. I had just a little disagreement with WordPress here, and let it have its own way. 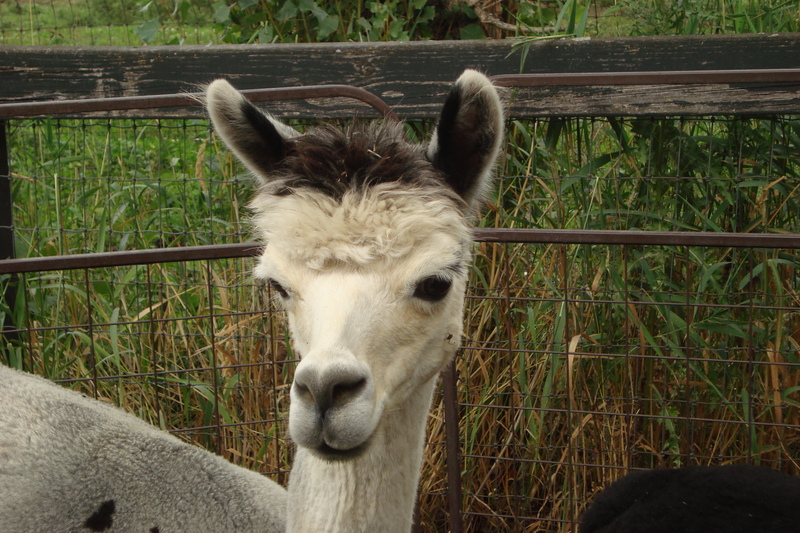 Hence you will see not only the attendees, but also the animals of Moonshadow Farm which we toured on Saturday. 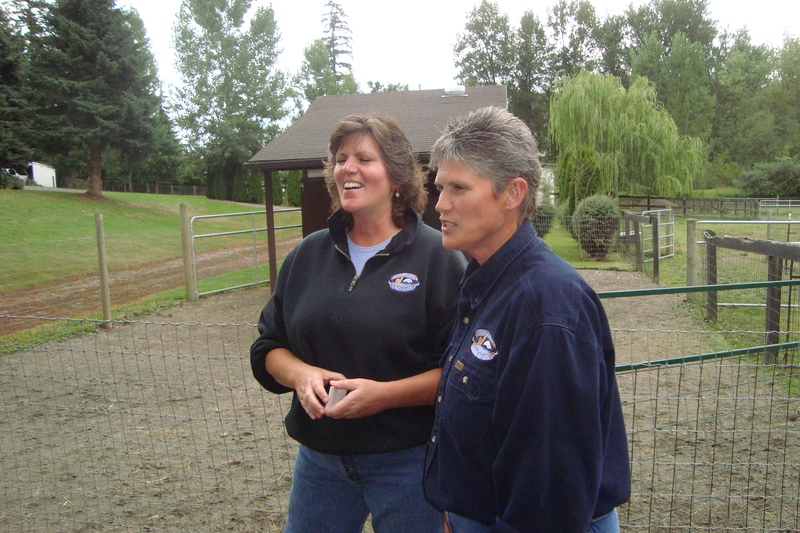 We also got to tour Moonshadow Farms run by Deb and Nancy. 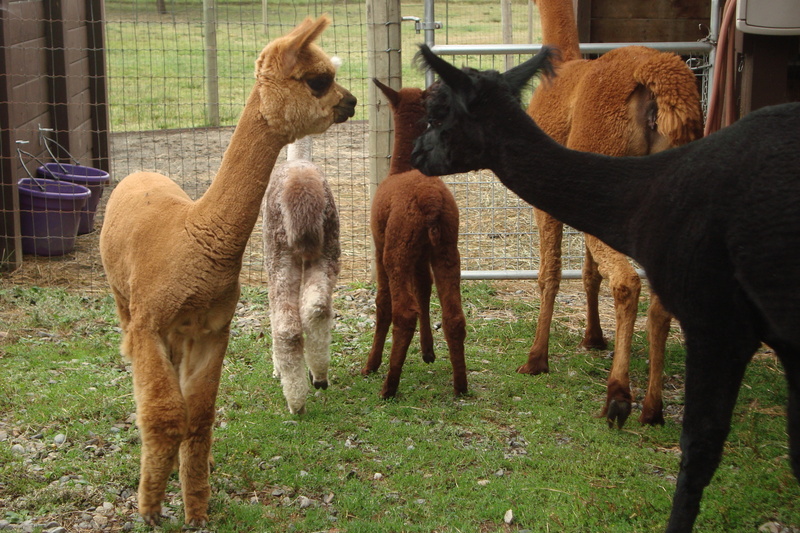 It was such a pleasure to have them show us the animals – all those gorgeous alpacas, mothers and babies. 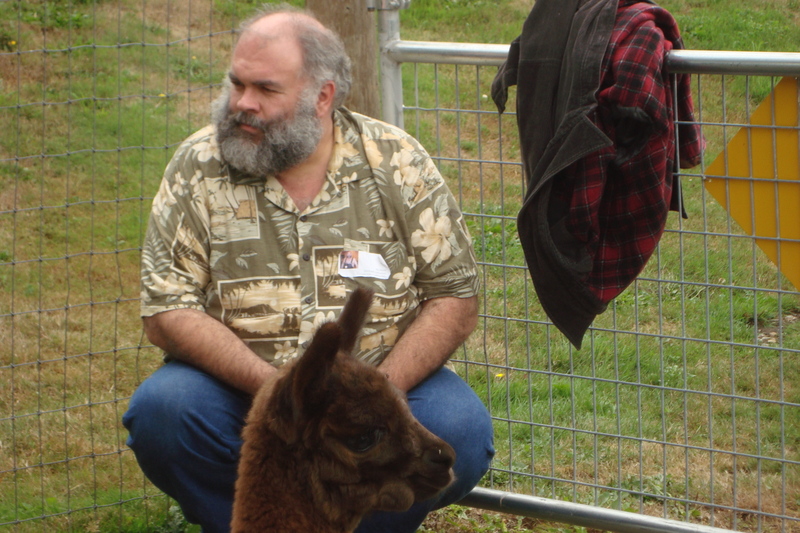 It was a great day – folks were enjoying the weather and the animals. Yes, I had a great time. I can hardly wait for the next West Coast retreat – but I will have to settle for the fact that over the next year I will be cementing my links with the men I met here this year. 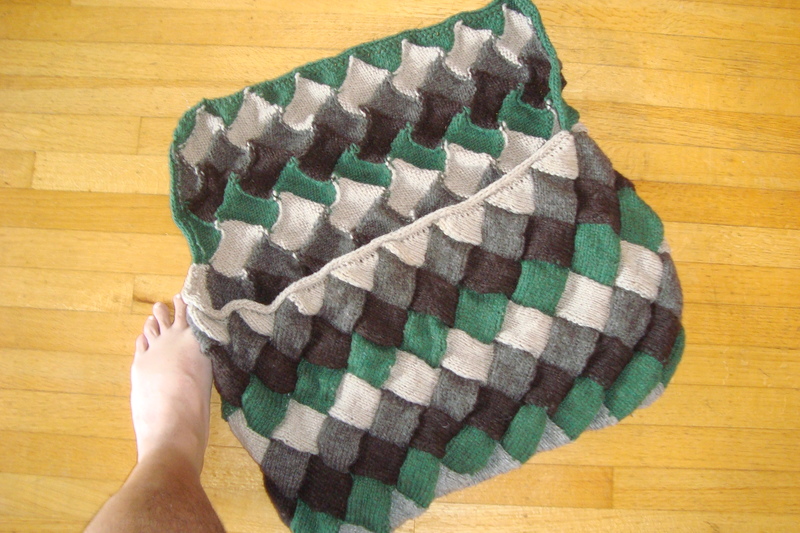 Ah, remember my plan to knit a messenger bag using Entrelac? Here’s how it looked in April of this year. Entrelac messenger bag in process. The plan was to finish it, then felt it severely, affix a strap and voila, a beautiful, hand-made, unique messenger bag for me. 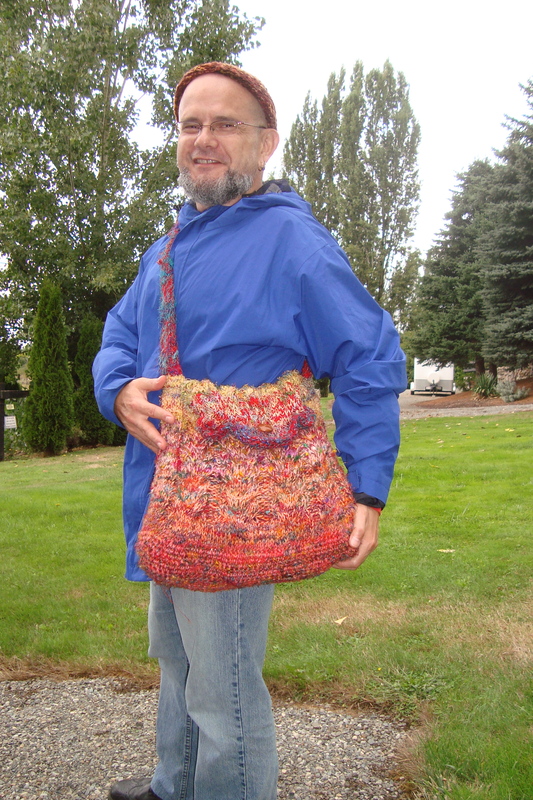 Here’s the bag finished with a lovely flap knit right in, I-cord bind off. Looking good. The bag open. Note my foot for size comparison. “The best-laid plans of mice and men” you say. Indeed. I finished the bag and went off to Spain before I found an opportunity to felt it. It looked bulky but I was looking forward to getting it into the wash and shrinking it down to wearable size. Hah! Sounds so easy, doesn’t it. A couple of weeks ago, I finally took the plunge and got the bag into the bathtub where I was going to felt it with bath tub temperature water and a broom for agitation. You know how that went, I bet. It didn’t take long to realize that I was not the equal of a good washing machine. But the problem is that I don’t own a washing machine – we use the machines supplied by our building which are housed in the basement. But since that was the only available machine, I took the soaking wet, heavy-as-lead bag down to the nether reaches of the building and dumped it unceremoniously into the machine, set the dial for hot water, threw in a pair of jeans as extra insurance and turned the thing on, then left it alone for the required half hour. I figured it would never felt to small, so no worries about that. Back to the basement where I threw the mass into the dryer, set the dial, and let it go for an entire hour of heat pumping in – our dryers really put out heat, so I figured that could only help. Then I did my best to clean the lovely lint off the sides of the washing machine. After it finished and was indeed bone dry, I took it out, cleaned out the lint trap and took the thing upstairs, where I showed it to my husband. Hmmm, not exactly small, this bag. Here’s what it looked like spread out on the hassock. It looks a little big, doesn’t it? A little. 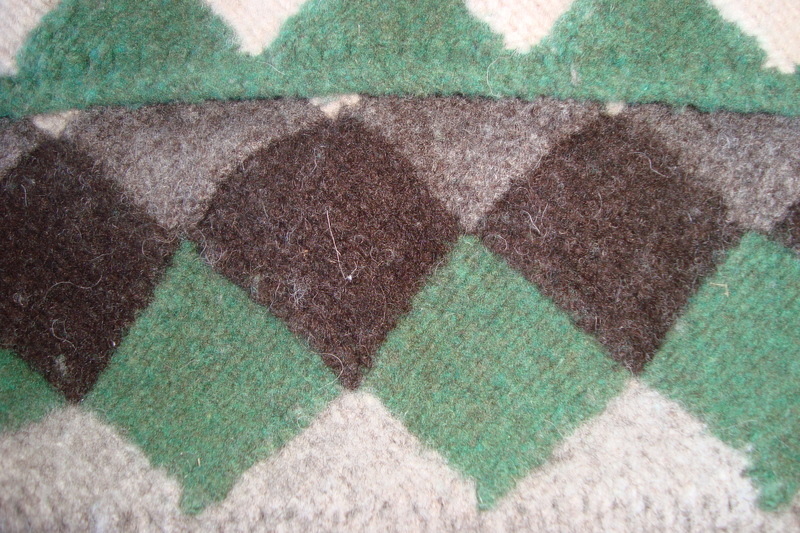 Here’s a close up of the felting – not quite as good as I’d hoped. But you can see the lovely I-cord bind off really well. Yes it was bigger than expected. “How big?”, you ask. Really big. Well, my husband demonstrated that for me a couple of days after I did my felting. I was out knitting and when I got home, this is what he showed me. Yep, this little baby is stuffed with a full-sized pillow, one with a pillow sham on it. And yes, that is a human-sized chair it’s gracing. Big? An understatement. Let’s say I’m not going to be carrying this around slung over my shoulder with a great looking strap. As a matter of fact it is about the right size to be a carpet-bag, which would be great if this was the Dirty 30’s and I was an itinerant salesmen, but it ain’t and I’m not, so there will have to be other solutions. I have had suggestions – and yes, pillow is one. I polled a few people and asked what they thought of me cutting it down and making it messenger bag sized. But that would mean the edging would be missing from one side. One of my consultees suggested I could do that, then call it a “Deconstructed Aesthetic” (thanks, Rodger). Anyone else with suggestions for this rather large piece of fabric (which took hours of my time, and lots of yarn but not costly stuff, thank heaven) is welcome to comment and give an opinion. I’m looking forward to it as a matter of fact. 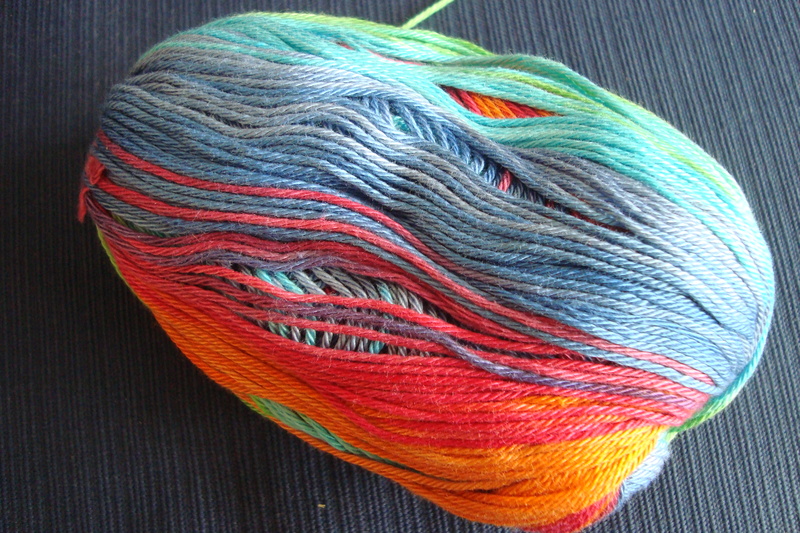 I bought some great multi-colour self-striping yarn in Spain while I was walking the Camino de Santiago in the spring. It’s Katia’s Bombay which is also available in North America. I only bought two balls since I was travelling light, so I needed a small project to use it. While we were in Spain, my husband bought a couple of those light scarves that Spanish men can drape around their necks so casually and with such elan that one suddenly wants to move to Europe to be among such fashion forward people. Alas, that is not to be, but I realized that this brighly coloured, self-striping cotton yarn would make a great flingy scarf, so my project was born. After looking around I found a lovely scarf pattern called Palindrome with a reversible cable which would fit the bill. 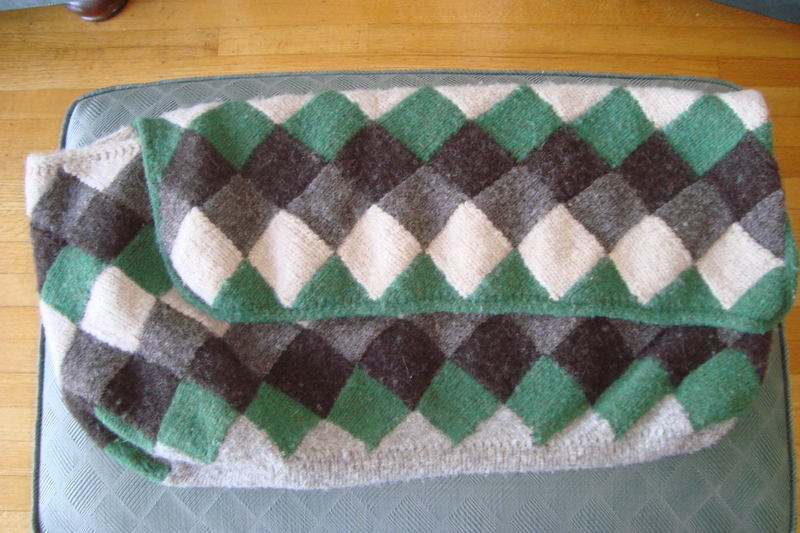 On Ravelry the scarf is listed for 1029 projects, and that doesn’t include mine yet. It’s by Kristin Bellehumeur and is a very easy project, which may explain its popularity. And since it’s reversible it really is great to drape around a neck. I did want the scarf to look good all over so I decided that I would find a tubular cast on to make the ends look good. I have used the Italian Cast-on before and it was perfect for this project, but I also had a little fun making it work for a 2 x 2 rib. The Italian cast on is a 1X1 rib and I needed a 2X2 rib. The Italian Cast-on is, in essence, a double fabric. By knitting the knit stitches and slipping the purl stitches on either side, one is making the front and back of the fabric. Creating the 2×2 rib also has the effect of returning the double fabric to a single one. I don’t have a link for this so I photographed the process for you and provide it here in a few simple steps. Step 1, Knit the first stitch. 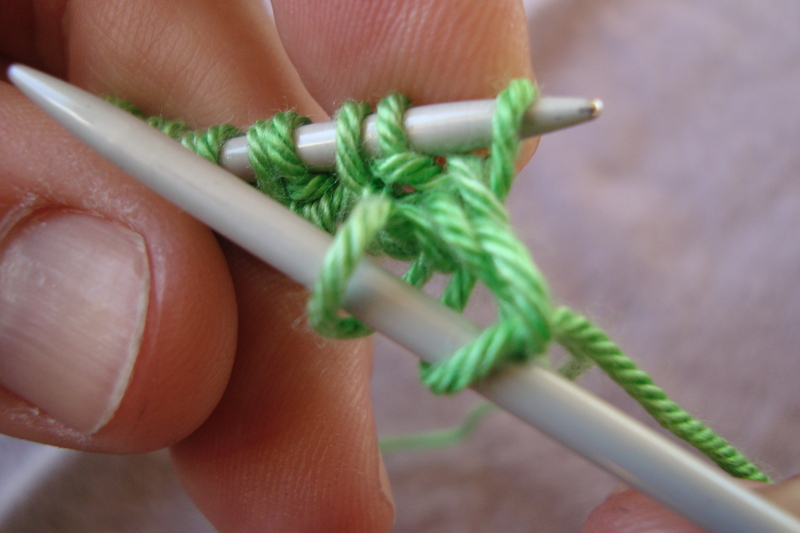 Step 2: Skipping the next purl stitch, put your right hand needle into the next knit stitch as if to purl. Step 3. 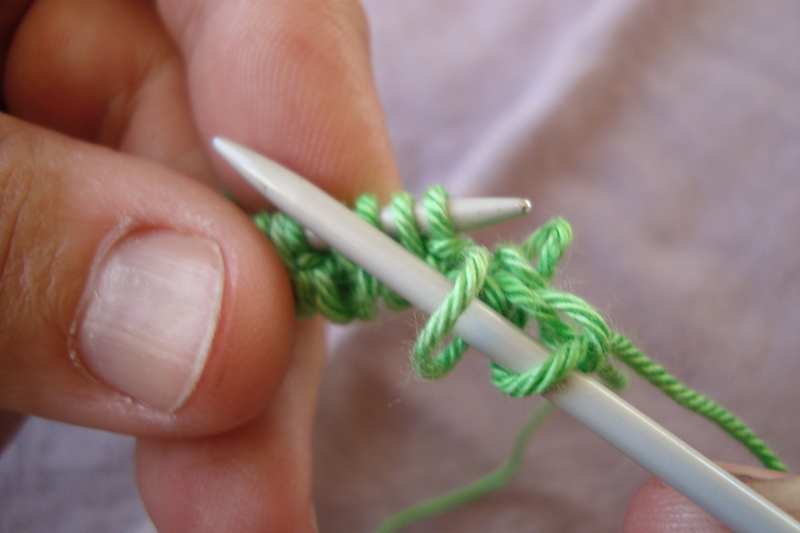 Slide both the purl stitch and the knit stitch off the left needle while keeping the knit stitch on the right hand needle – don’t panic. Step 4. Let the purl stitch fall to the back then immediately scoop it back up on the left hand needle. Step 5. 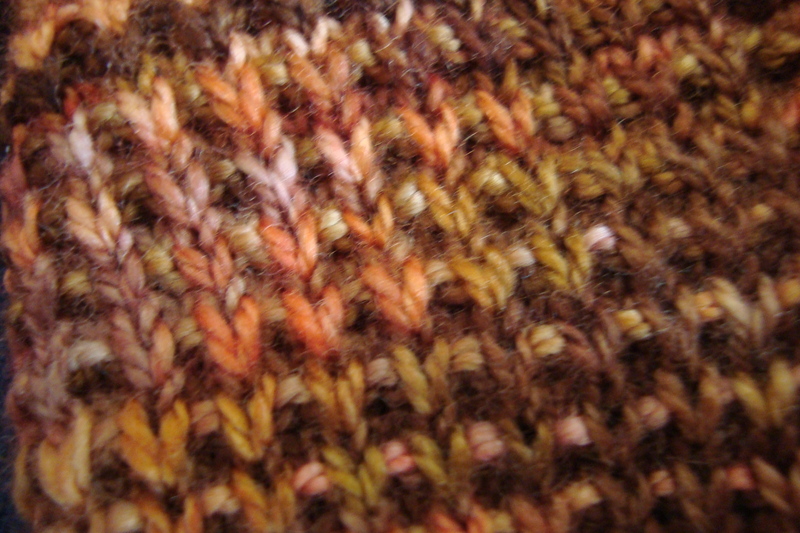 Put the knit stitch you moved to the right needle back on the left needle, then knit it. 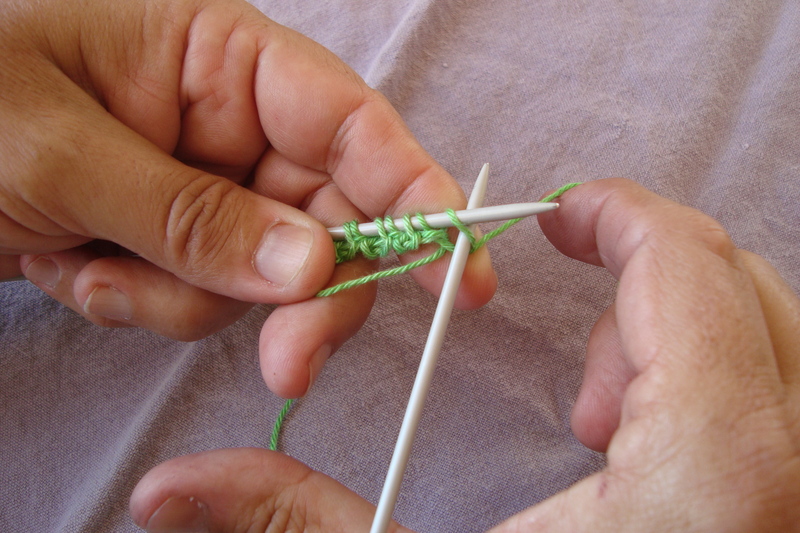 Note, in the picture the right needle is in the stitch as if to purl. You’ll have to remove it to knit the stitch in the correct orientation. Step 6. Purl the next stitch (the one you dropped in step 4). Step 7. Purl the next stitch, then knit the next stitch. Two knits, two purls, one knit, ready for step two again. Here you want to get the stitches back to their 1×1 rib double fabric which is how you started. It’s easy really. You just have to reverse the process of slipping and moving stitches, thus creating a tubular fabric again. 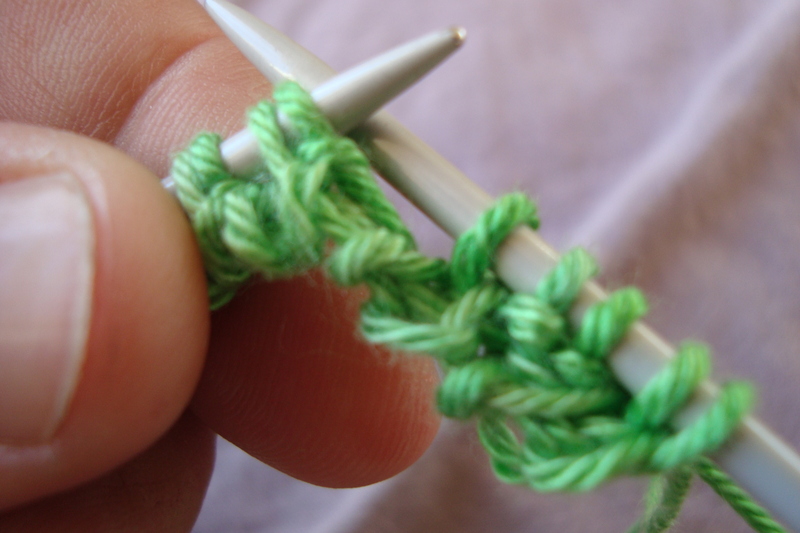 Step 1: Knit the first stitch. 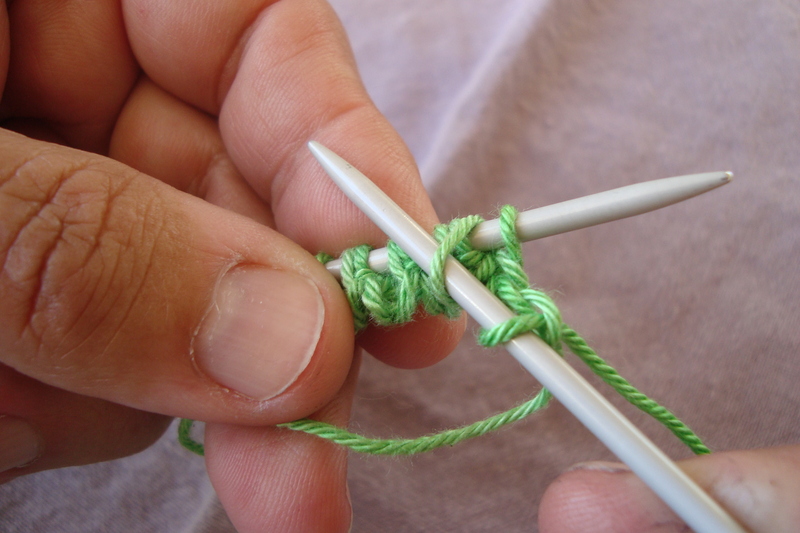 Step 2: Place your right hand needle into the second stitch on the left hand needle (a purl stitch). 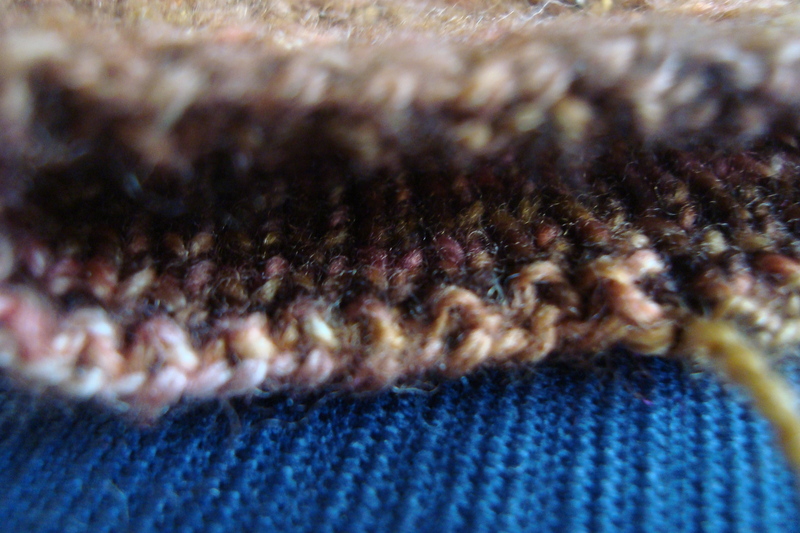 Step 3: Slide the two stitches off the left hand needle letting the knit stitch fall to the front of the work. 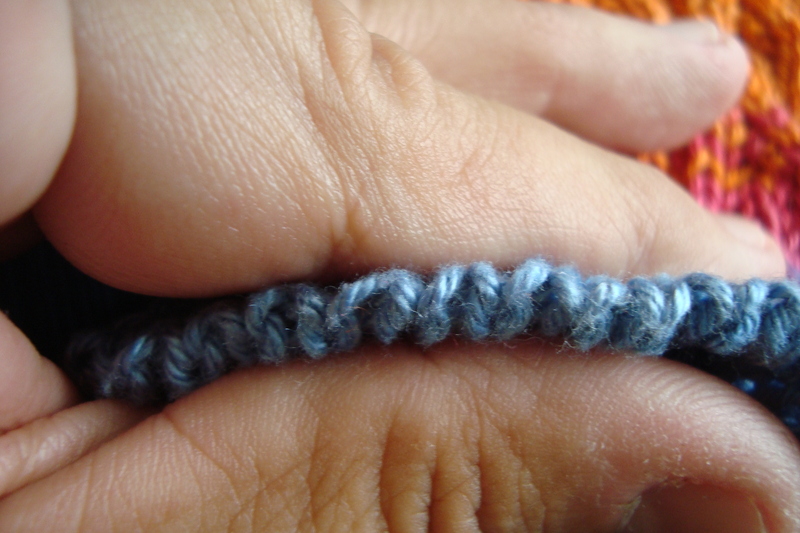 Step 4: Pick up the purl stitch with the left hand needle then pick up the dropped knit stitch with the left hand needle. Step 5. Purl the next stitch, knit the next stitch, purl the next stitch. Repeat from Step 2 to end of the row. To create the double fabric turn the work. Row 1: Knit the first stitch, slip the next stitch with the yarn in front, repeat to end of row. Turn. 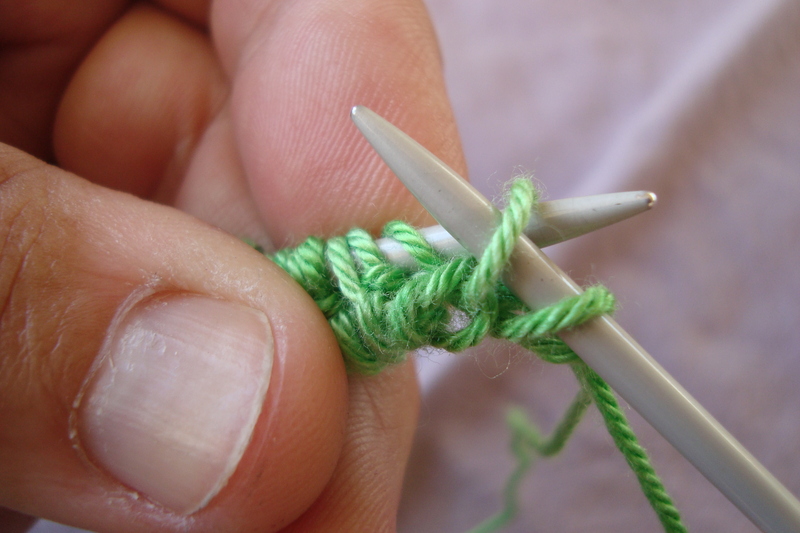 To cast off in tubular knit you will have to divide your stitches. 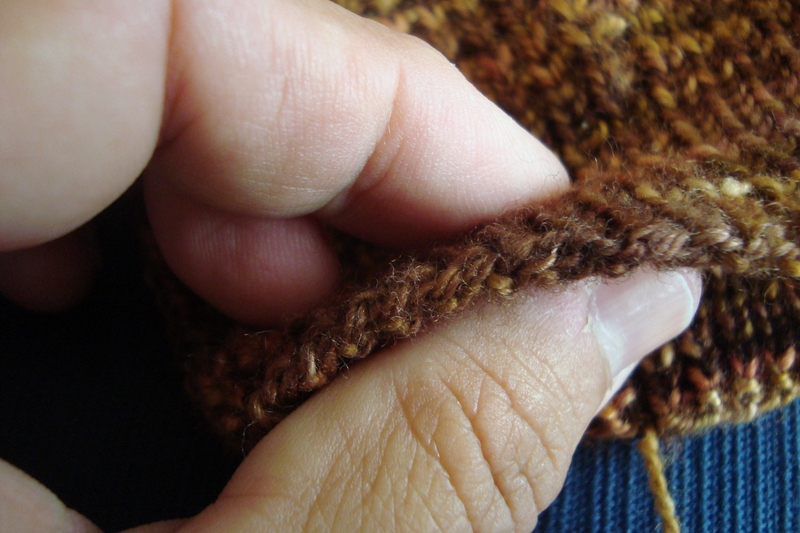 Using two needles, slip the knit stitches alternately with the purl stitches to the front and back needles. When you are finished you will have all the knit stitches on the front needle and all the purl stitches on the back needle. Now all you have to do is graft the sides together using Kitchener stitch. 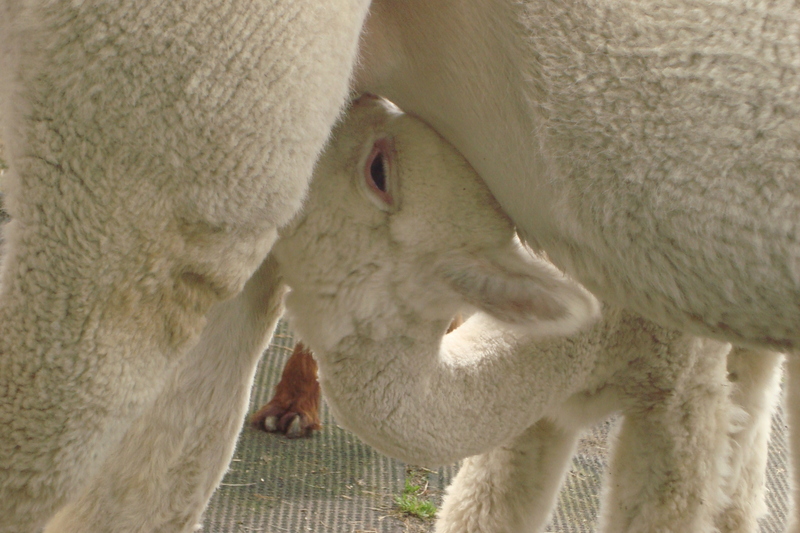 I recommend using the technique espoused by Knitting Daily in a recent post on their blog. 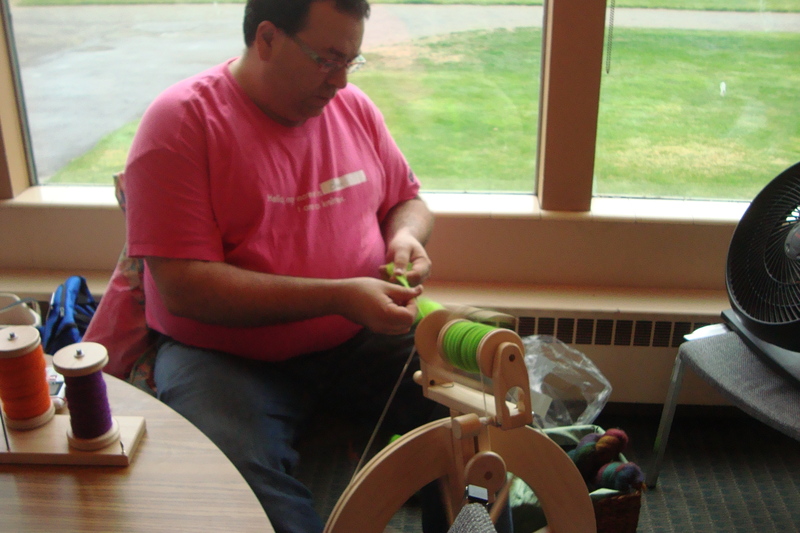 It uses a third knitting needle and is easy to follow. Can you tell which is the cast on and which is the cast off edge? Nope, neither can I. So there you have it, my adventure with Katia Bombay yarn, knitting a Palindrome scarf and making it look great from end to end. 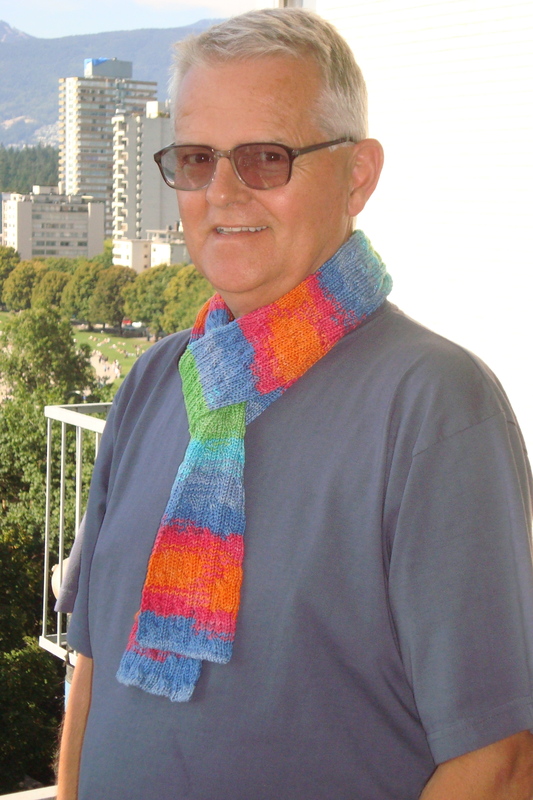 Here is the scarf flung jauntily, in a very European Je ne sais pas flair around the neck of my husband. Looks great even if the weather outside doesn’t call for cold any time soon. Geordie looking positively Spanish in his Palindrome scarf. And here is the scarf coiled seductively as if it were dropped after an evening of cool weather dining outside on some lovely cafe patio in Madrid. Go on now, make your own beautiful scarf with a wonderful cast on and cast off, and fling it ’round your neck for some insouciant European flair. Which do you do? 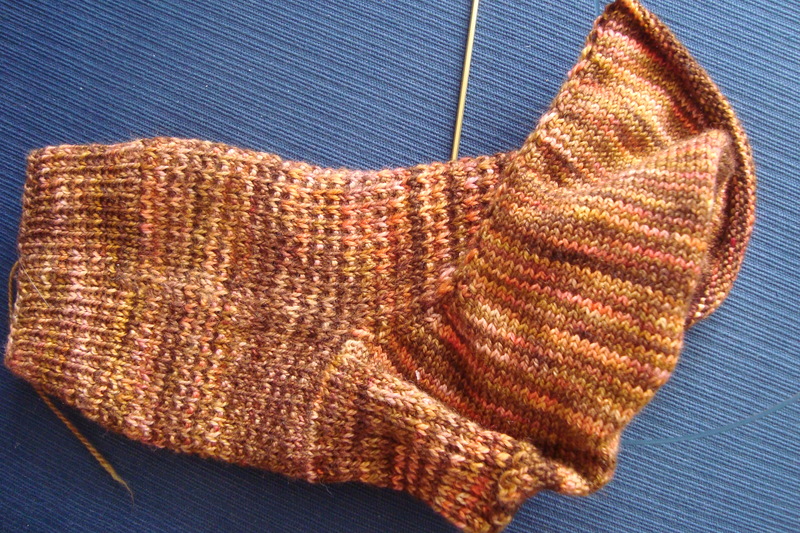 I’ve been knitting toe-up socks for some time and I have really enjoyed the process. I can now knit any sock using the knowledge I have about constructing a toe-up sock – the toe, the foot, the gusset increase, the heel flap, the gusset creation and the leg. See, it’s all easy – each part has its construction process, and if you follow it, there you are, a sock – or two if you’re happy with the first one. My most recent sock, however, is a top-down sock. Why? Because I’m going to the Sock Summit and I figured I needed a refresher so that I wouldn’t seem unknowledgeable in any of the classes I’ve registered for. Experience does count for something, after all. I chose a very simple pattern called Faceted Rib Socks from the Little Box of Socks which I received for Christmas from Holli. I like the look of the pattern with the yarn I’m using, a 100% merino hand paint from Fleece Artist. But it has not been a pleasant knit, not because it’s difficult, (it’s a 4 row pattern, easy-peasy), but because I seem to lose attention and after knitting blithely away, I have discovered at least 3 times that I’ve forgotten to knit one of the rows, so that I’ve needed to frog the sock, and get those silly stitches back on the needle. 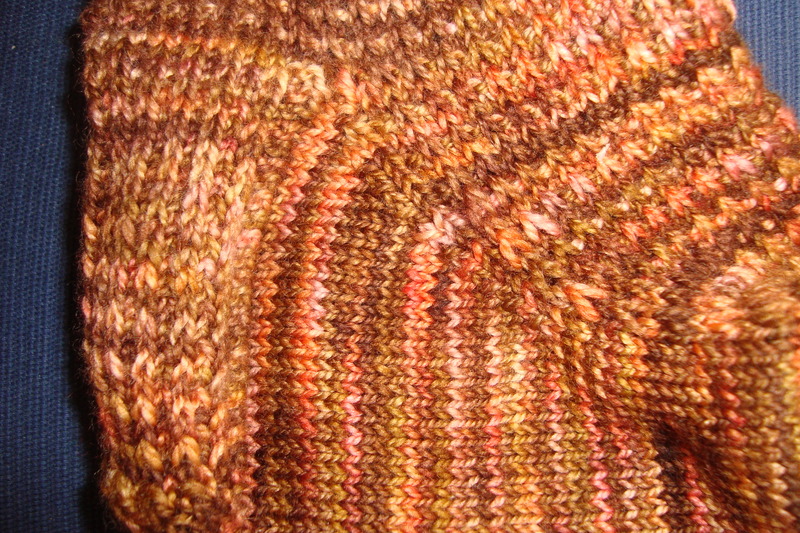 I also lost a stitch somewhere while knitting the heel (or maybe I gained one, who knows? ), so when I discovered the missing stitch while knitting the gusset, I had to include an extra stitch so things would work out tidily. I also found that I lost interest as I knit, so that I often didn’t knit more than 8 rows before I would stop, put the needle down and do something else. So now I have to get back to knitting them. I have to get to the end of the foot, decrease for the toe, do the kitchener stitch on that, and then cast on all over again for the second sock. At least this time, it should be less knitting, because I won’t have to knit the two extra inches I did the first time before I realized, after frogging, that the sock was perfect at the shorter size. To get back to the question I asked at the beginning – top-down or toe-up? Well, to juggle language a little, toe-up wins hands-down. It’s easier for me because I have control over the length of the foot, I love using Turkish cast-on for the toe, and I really like not having to pick up stitches. Okay, I admit it, it wasn’t that hard to pick up those stitches, but it was still something I can do without. What did I learn from my top-down sock experience? Well, yes, you can still knit it using Magic Loop; I learned a new cast-on for me, Twisted German Cast-on, which does give a good stretch to the cuff of the sock; I didn’t suffer too much from having to pick up some stitches, even if I did lose a stitch somewhere or other. I also learned that I have a rather limited attention span, and need to focus just a little better when I’m knitting so that I don’t forget to knit a row every now and again. But the most important thing I learned? I really love knitting toe-up socks and I’m going right back to it as soon as I finish this pair. 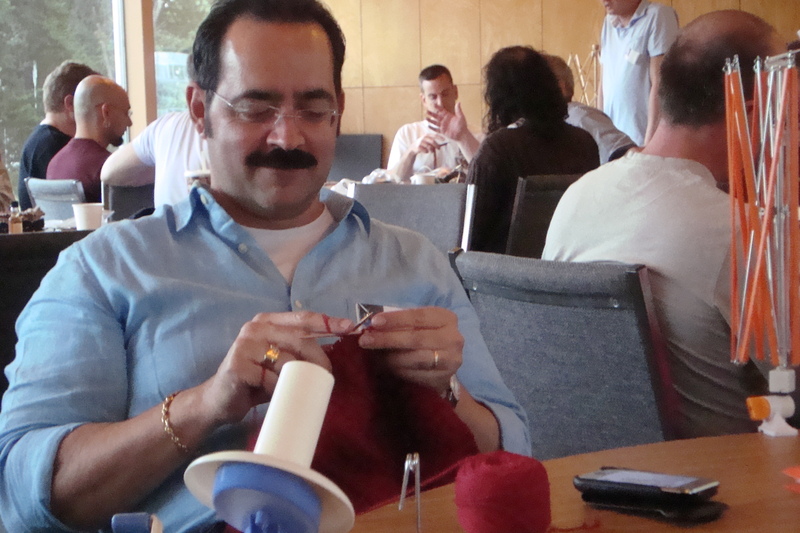 Yes, I can knit top-down, but darned if I have to. Thanks to Wendyknits, Cat Bordhi and all those others who went ahead and figured out how to knit our socks from the toe I know that knitting toe-up is the more pleasurable experience for me. And if it isn’t a pleasure, why do it? That is the question and the answer is obvious – don’t do it. It’s been a long time. 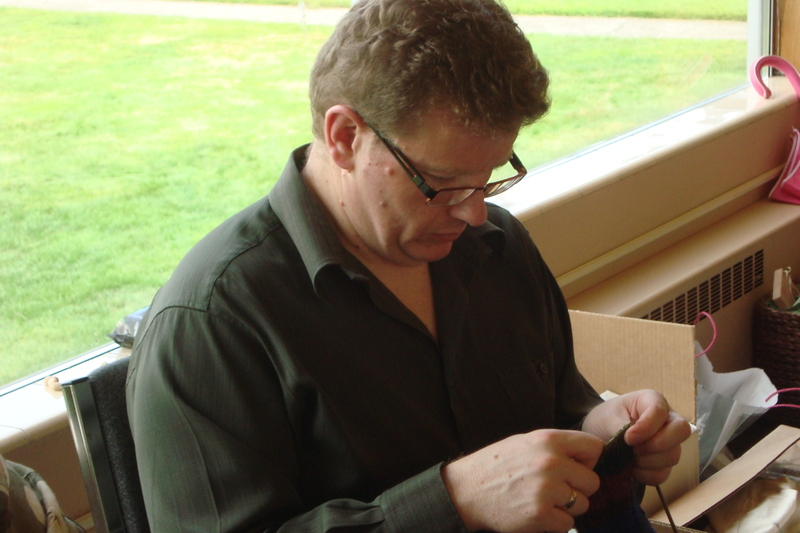 I have not felt the inspiration to blog as I should even though I have been knitting up a storm. Blame it on nothing. But today I put my Twitter feed up on my blog, so at least there will be new content. 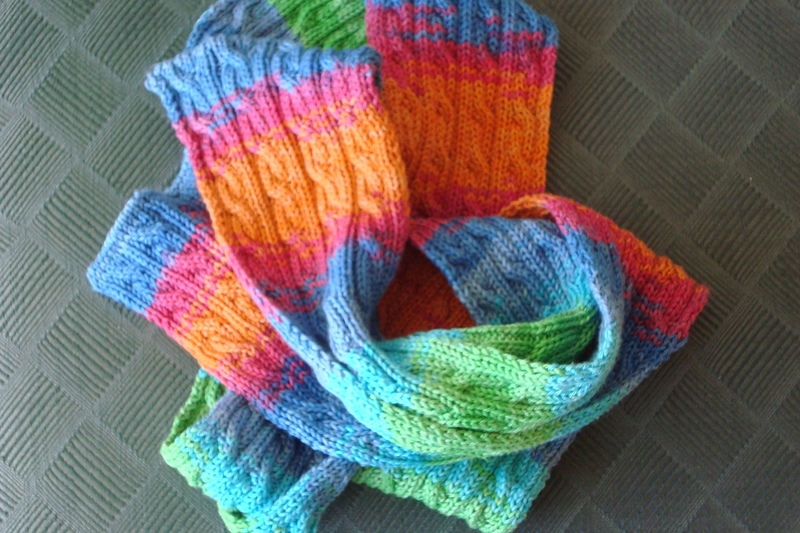 Knitting up a storm: Designed and knit a pair of socks last week, knit two hats yesterday and today, finished off several other hats that needed additional decoration, started another sock today – same design, new yarn, hand-dyed, new recipient. I think I may be coming back from my depression. That’s what this has been about – the non-participation I mean. I have other ideas to kickstart myself too. You’ll be hearing from me. I have a confession. 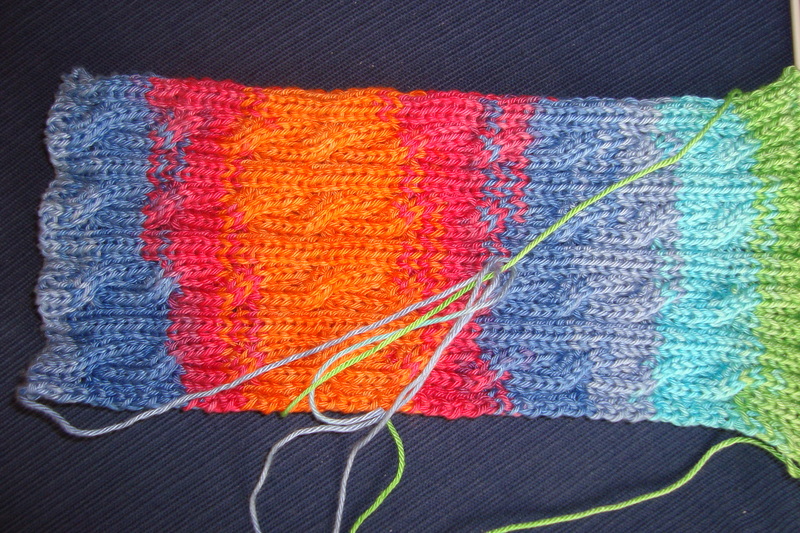 I have considered entrelac one of my least favourite looks in knitting. I have seen some bad entrelac – a sweater in pale blue and white that made the woman wearing it look a lot like the Michelin man. It somehow seemed to be a technique that was more interesting in the theoretical sense than in real life. 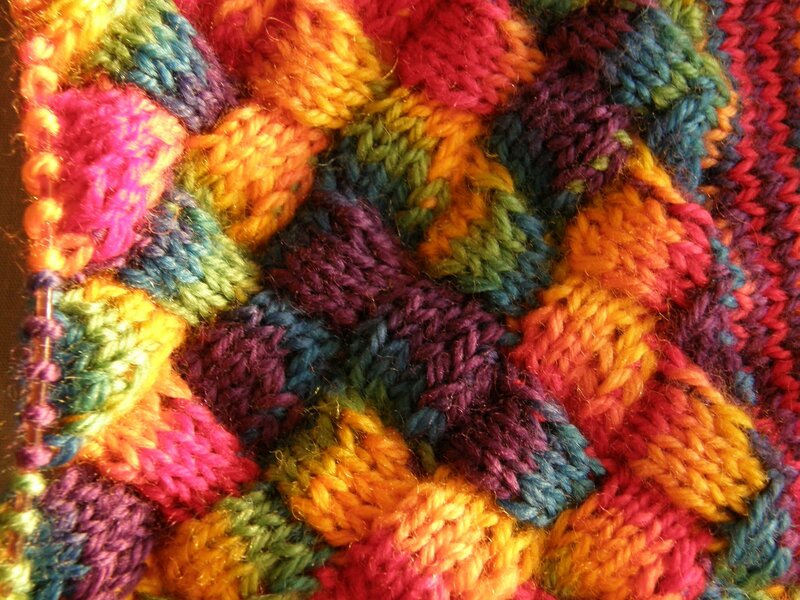 But recently I have been guilty of actually knitting entrelac myself. And why? Because I feel that I need to learn more about knitting – to become a better knitter and to add to my knowledge of how knitting works. I have been discovering a few things and have recently been inspired by Anna Zilboorg’s Knitting for Anarchists. 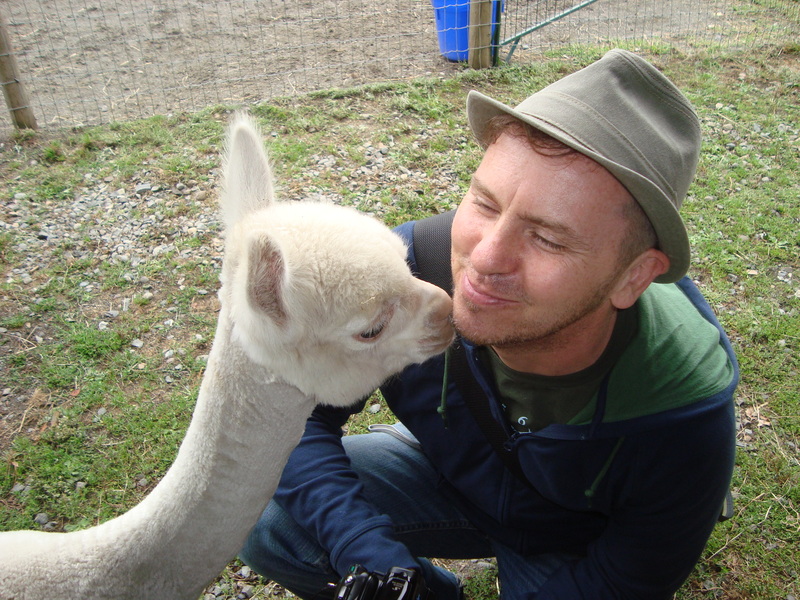 I told a friend that and he looked at me as if I had two heads – and immediately told me that I was no anarchist – to him I was a rule bound knitter who thought there was a right way and a wrong way to knit, and perhaps even that I thought that my knitting was the “right way”. I admit it, I am certainly a rule follower, I like to follow a pattern, even though I have certainly done without. And I think I have been breaking out of that rule-bound shell. If you look back at my recent blog you can see my Elizabeth Zimmerman Seamless Hybrid Shirt Yoke sweater, which gave me a lot of unease, but which I feel I completed very successfully, even though I needed a little hand holding by a few fellow knitters to get through it. But that wasn’t the first time I had knit an EZ sweater. 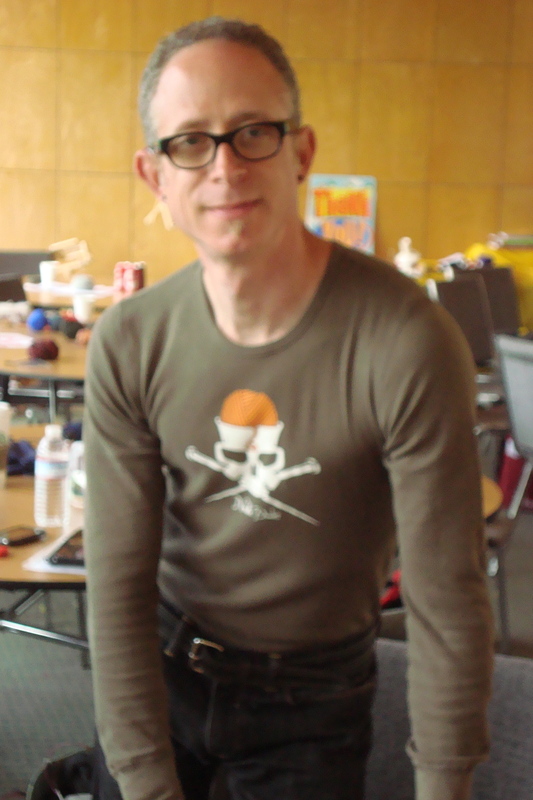 I don’t have pictures, but in fact, about 20 years ago, I knit an EZ ski sweater in the round, using two colours, steeks and my own blocked out designs. So I certainly had a sense of adventure back then. I have also thrown myself into knitting lace, from a pattern, yes, but bravely, learning the ins and outs of the pattern as I went. But let me get back to Entrelac. That friend I mentioned earlier has knit several entrelac pieces recently, including a sweater from a book called Out of Africa which he adapted as he went. The sweater is redeemed as well by the fact that it was knit in very fine yarn, so there is none of that puffiness that a larger yarn makes almost inevitable. So I decided that I was not afraid to knit entrelac and that I would find a project to do. And since I have been knitting socks, and reading about knitting anarchy, I searched around and found the perfect project, the Entrelac Socks, designed by Vickie Starbuck, in Socks, Socks, Socks, edited by Elaine Rowley. 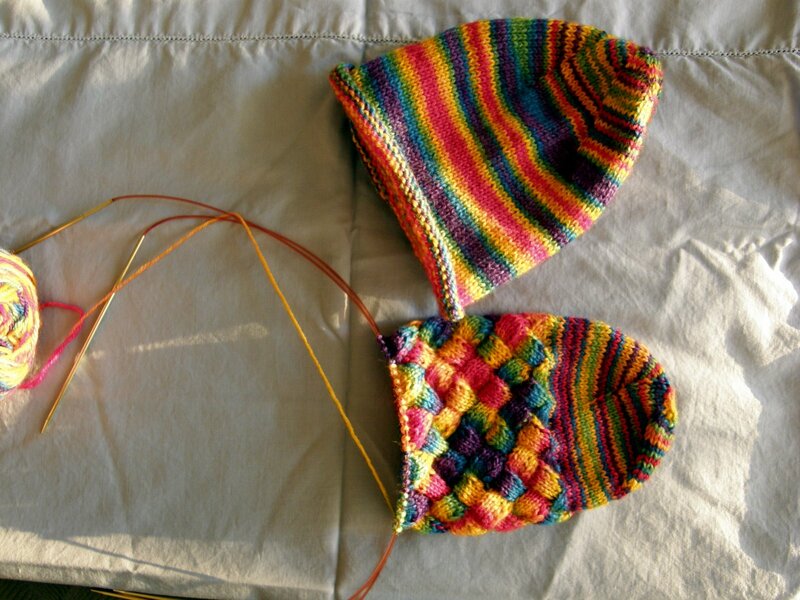 The socks are done in the round, they are toe-up, they are entrelac – what more could I want. And I took my anarchist lessons to heart and taught myself how to purl backwards so that I could do the socks without constantly switching from one side to the other. I was also inspired by the Yarn Harlot. A few weeks ago she posted a blog entry about the Toronto Pride Parade, and shared some of her yarn recommendations for Pride. And I happened to have a ball of Rainbow dyed sock yarn from Lorna’s Laces which has been in my stash about two years. Time to do something with it. So here’s your first look. I have already finished sock number one. But there was I a little problem – sock number two would be a challenge since the yarn for it had already been knit into a hat. That hat was Half Dome from Knitty.Com. And I posted a picture of it on my blog way back in 2006. Here it is. And here it is next to its friend the sock. So obviously there was a dilemma here. But easily solved. I would rip the hat back, because to be honest I was never going to wear that hat, and nobody I knew was going to wear it either. And that gave me another challenge – what to do with yarn that has been a hat for two years. Boy, is it crinkly when it is frogged. However, still acting as anarchically as possible for me, I remembered reading about how to get the crinkles out of knitting, so I first wound the yarn into a hank over the back of one of my chairs, then ran a nice sink of hot water, and after tying off the hank, I hurled it into the water and swished it around for a minute or so – and to my delighted surprise, it seemed that the crinkles came out instantly. I took the hank out, squeezed it to get out some of the water (someone suggested maybe I didn’t need to be as vigourous with the drying as I had described in an email), and then laid it on a towel to dry. A day later, that yarn was ready for knitting and I was happy because I could really consider that I could wear my Rainbow Entrelac socks at our upcoming Gay Pride Parade here in Vancouver. 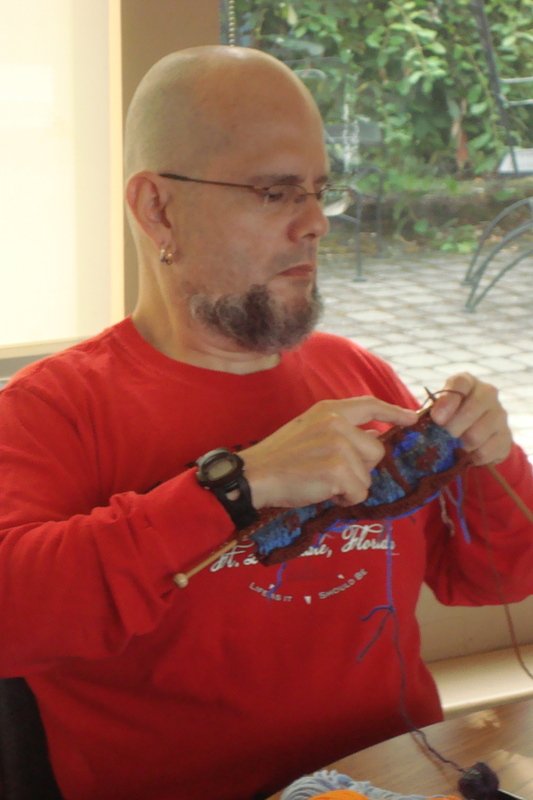 So here I am, working on my anarchist skills, and knitting up a storm with some wild Rainbow socks. For those of you who like to get up close and personal, here is another look at my sock as it was growing under my needles. 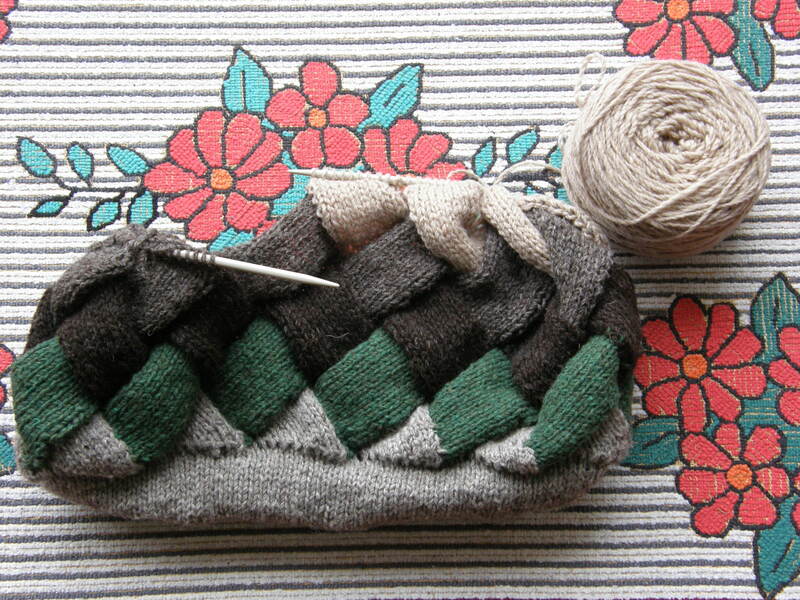 I’m working on sock two and it will certainly be finished in time for the parade. Look for me on the street – look down to see my socks, worn with Pride and a sense of accomplishment. 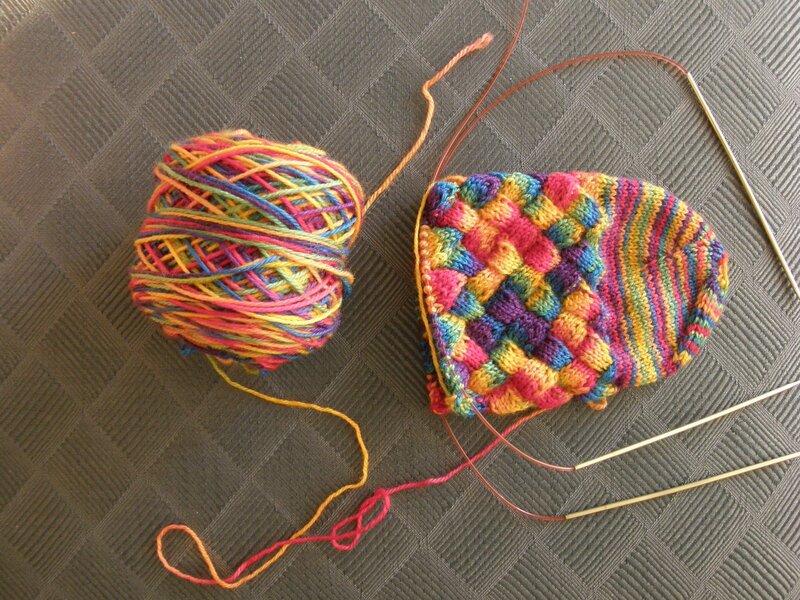 OMG – I just discovered that our friend The Yarn Harlot has knit the same entrelac socks, but her experience was somewhat interesting. Just for the record, I followed the instructions (such an anarchist) and had none of the problems that the Yarn Harlot had first, but which she apologizes for misunderstanding.